The Azco Bluetooth Audio Adapter lets you listen to music from your iPod, iPhone, iPad, Android, Windows phone or other Bluetooth device - on your home stereo! 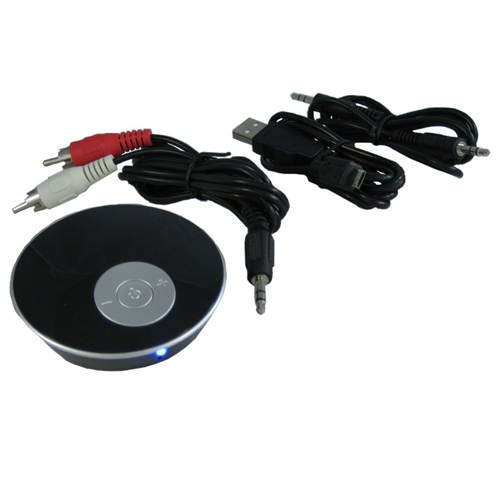 Simply connect the adapter to your your home stereo system with the included RCA stereo cable and then pair your mobile device to the adapter. Enjoy the convenience of a wireless connection combined with superior quality music on your stereo. The adapter can be powered by a AAA battery, or by the included USB cable. For USB power, connect the USB cable to a powered USB port or USB power adapter/charger (not included).